Renewable energy resources are generally defined as energy that comes from resources which are naturally replenished on a human timescale such as wind, sunlight, geothermal heat, and water in the form of rain, and tides, waves. 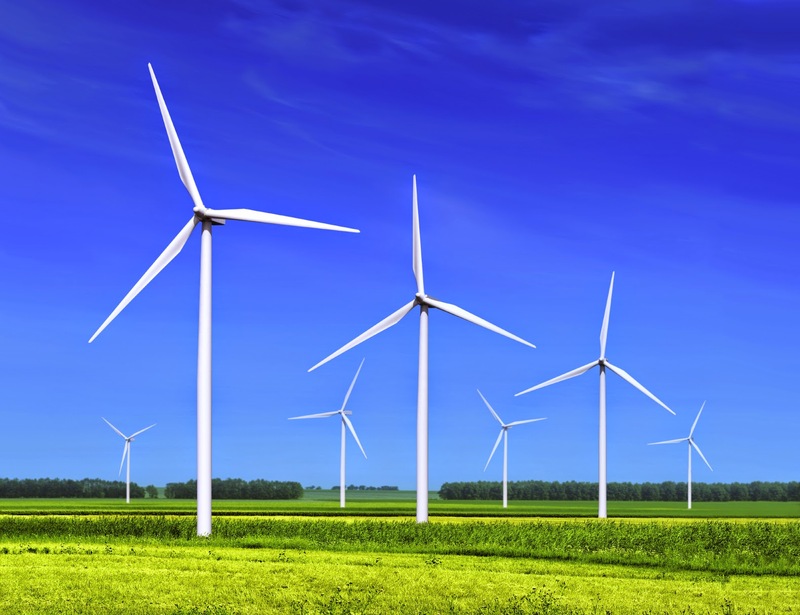 Wind power is the conversion of wind energy into a useful form of energy, such as using wind turbines to produce electrical power, windmills for mechanical power. Wind has been recognized as a source of energy, in some capacity, for several hundred years. People used wind as the sole power source for boats, to pump water, or grind grain. Wind is a form of solar energy. Wind is caused by the uneven heating of the atmosphere by the sun, the irregularities of the earth's surface, and rotation of the earth. Wind flow patterns are modified by the earth's terrain, bodies of water, and vegetative cover. This wind flow, or motion energy, when "harvested" by modern wind turbines, can be used to generate electricity. The terms "wind energy" or "wind power" describe the process by which the wind is used to generate mechanical power or electricity. Wind turbines convert the kinetic energy in the wind into mechanical power. This mechanical power can be used for specific tasks. A generator can convert this mechanical power into electricity to power homes, businesses, and schools. Wind turbines, like aircraft propeller blades, turn in moving air and power an electric generator that supplies an electric current. Simply stated, a wind turbine is the opposite of a fan. Instead of using electricity to make wind, like a fan, wind turbines use wind to make electricity. The wind turns the blades, which spin a shaft, which connects to a generator and makes electricity. The first windmill used for the production of electricity was built in Scotland in July 1887 by Prof James Blyth of Anderson's College, Glasgow. Blyth's 10 meter high, cloth-sailed wind turbine was installed in the garden of his holiday cottage at Marykirk in Kincardineshire and was used to charge accumulators developed by the Frenchman Camille Alphonse Faure, to power the lighting in the cottage, thus making it the first house in the world to have its electricity supplied by wind power. Blyth offered the surplus electricity to the people of Marykirk for lighting the main streets of the town. They turned the offer down because they thought electricity was the work of the devil. Although he later built a wind turbine to supply emergency power to the local Lunatic Asylum, Infirmary and Dispensary of Montrose the invention never really caught on as the technology was not considered to be economically viable. There are two basic types of modern wind turbines: the horizontal-axis variety, and the vertical-axis design, like the eggbeater-style Darrieus model, named after its French inventor. Horizontal-axis wind turbines typically either have two or three blades. These three-bladed wind turbines are operated "upwind," with the blades facing into the wind. As you can imagine, there are advantages to using wind as a source of energy. But there are, however, disadvantages that must be considered. Both are listed below. Although wind power plants have little impact on the environment compared to fossil fuel power plants, there is some concern over the noise produced by the rotor blades, visual impacts, and birds and bats having been killed by flying into the rotors. Wind turbines can be built on land or offshore in large bodies of water like oceans and lakes. Though the United States does not currently have any offshore wind turbines, the Department of Energy is funding efforts that will make this technology available in U.S. waters.